It was just a month after my cousin brother, Lobsang Jamyang’s self-immolation in Tibet which I overheard a conversation of two students in my school in which one of the students said to the other “Why don’t they die after New Year? It disturbs our New Year Celebration”. Even though he was not directly addressing to me, but his words penetrated into me like a sword. I thought of grabbing him and kicking him once or twice. But I swallowed my anger and went away sadly. Whether the self-immolation is the best form of protest or not, my cousin and others; they all definitely put their own precious lives to an end with the hope of a better future for Tibet. They all love Tibet more than their own lives, and that’s why they sacrificed themselves for our country. It is not that they undervalued their lives. In the case of my cousin, he had his own dream just like you and me–to raise a family and bear a child, live long and spend life happily. He was a very loving and energetic man and specially, he was very friendly and cooperative to his neighbors. He was ready to start a new life with new ambition. He was comparatively educated and even got some awards in Tibetan writing competitions. However his love for his country was more than the love for himself. I know that other self-immolators had similar thoughts too. Dying is not an easy one; especially burning of oneself to death. Sadly many of us even can’t feel their pains. Those who immolated themselves had decided to leave their loved ones- parents, brothers and sisters and family. They must have cried many times before leaving them all behind. They were the men who stood against the rules of tyranny and refused to listen to all the fake promises of the Chinese state government. They fought dauntlessly and died fearlessly. Even though we beg for negotiation and to address the plight of the people inside Tibet, China is hardly listening to us—not even to the cries of our martyrs who set themselves ablaze, demanding for freedom in Tibet and return of the Dalai Lama from exile. Instead, the Beijing government is escalating armed Chinese personnel and special forces into the Tibetan regions to forcefully crackdown, jail them up all and threaten them if any such protest happens again. Those Tibetans who risked their lives by raising their voices against the biased and ill-treatments by Chinese authorities in Tibet have been through unbearable sufferings. Heartless Chinese police and the paramilitary have destroyed almost all the historical monuments, scriptures and holy places in Tibet which are the core centers of Tibetan culture and regligion. All the monasteries are besieged and thousands of monks and lay people were killed and injured. 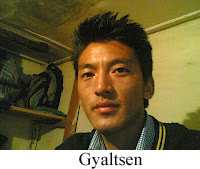 Tibetans are completely sealed off and let no one to see their sufferings and humiliations. Those Tibetans who stood with truth were branded as enemies and some were killed or put in prison without trail. It seems that our protests and specially the news of self-immolations fell on deaf ears but it is not true that Tibetan protests have gone unheard or unnoticed. These desperate acts of self-immolations do not get international attentions like the self-immolation of Tarek al-Tayeb Mohamed Bouazizi, a Tunician street vendor who set himself on fire on 17 December 2010, in protest of the confiscation of his wares and the harassment and humiliation that he reported was inflicted on him by a municipal official and her aides. However, the impact of the Tibetan self-immolations in Tibet was beyond measure. Right after the self-immolation of my cousin, people of all ages came to my village and helped the victim in such a manner that everyone seemed of belonging to our ‘family’. All the conflicts which once divided the people blurred away. Even if there was hatred and separation among the Tibetans earlier, everyone acted and felt like brothers and sisters, living and working together. Even my mother, who is in her fifties, started learning Tibetan language. She tried to speak in pure Tibetan language without peppering it up with Chinese language in between. We usually use many Chinese words in our conversation like we are using many English words in our conversation here (in exile). But because of all these tragedies, Tibetans in Tibet rarely use the Chinese language while they conversing and they try to promote the Tibetan language and culture in every possible way. This story took place in an impoverished village but when we earth out every such story together, it is crystal clear that all those protests specially the self-immolations triggered a new spark of unity, patriotism and nationalism among Tibetans and woke up many Tibetans from their deep slumbers. Truth does not work when it comes to China. China needs only loyalty thereby trying to cloak the truth lies in the history of Tibet. However, truth is always truth and that cannot be turned into falsehood by force and power. Even if many more Tibetans are killed, the truth of Tibet being a separate country from china over the centuries will remain as it is. Groundless accusations and criticism against H.H the Dalai Lama and Tibetans will never pave a way to solve the problems instead it will not leave both countries in peace. Moreover, China’s baseless accusations will make them lose their own image in the eyes of the world. I don’t need the world to be inspired by all these selfless sacrifices of all Tibetan self-immolators. It is more than enough if our own people get inspired by such selfless sacrifices of the self-immolators. NOTE—The author is a senior student studying in a Tibetan school in India and his cousin Lobsang Jamyang set himself on fire in Tibet in protest against the Chinese government in recent months.